If things get a bit rough, you may need to siphon liquids from one container to another, such as gas from a automobile gas tank to a gas can. If you've ever had the pleasure of performing this task, legally (or otherwise), you may remember the fun of locating a dirty hose, inserting it into the gas tank and putting your mouth to the hose and creating a vacuum to get the liquid (gasoline) flowing, with a nauseous taste of gasoline in your mouth before the flow began in earnest. As they say, "Been there, done that" and it's not fun. Especially now with all the anti-pollutant additives they now put in gas it is probably dangerous to your health. Now there is definitely a better way. The super easy to use, "The Original Safety Siphon Hose" does the dirty task for you. Just drop the "pump" end of the hose into the liquid you want to siphon and raise the hose up and down a few times to start the flow. The "pump" end contains a stainless steel spring and marble ball that creates a simple one-way value to let the liquid into the hose but not back out. Each time you lower the hose into the liquid a certain amount of the liquid is forced into the hose. When enough is in the hose, the "siphon effect" takes over and the liquid flows freely into your collection container with never a taste or touch to your mouth. This would be especially important to siphon liquids that are dangerous to even the slightest contact with your mouth. This incredible device is low priced. 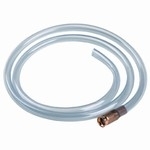 The Original Safety Siphon Hose length is 6' with an inner diameter of ½" and can be used on any chemical that does not attack the plastic of the hose. It is super easy to use and you will probably want to get several: one for each car and one for the shop or garage. It is ideal for use around the farm used with gas, oil, diesel, solvents, etc. Can be used on clogged sinks, water beds, fish ponds, aquariums, etc. 100% manufactured in the U.S.A. When you buy "The Original Safety Siphon Hose" you are getting the highest quality, safest and super easy to use siphon hose on the market today.